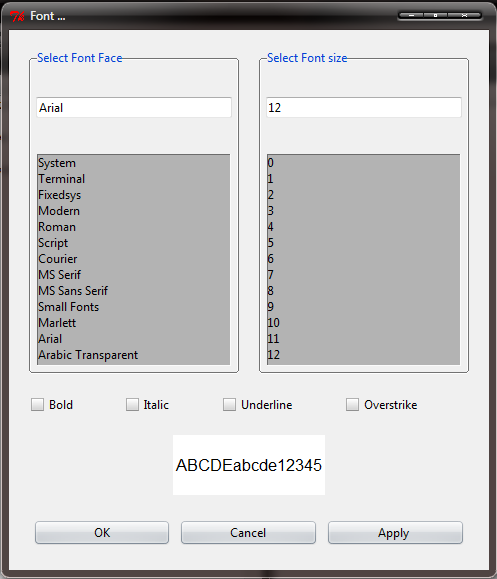 Font Selection Dialog Box are very important part to make GUI Setting More Easy To Understand for their user. basically, font selection dialog boxes help its user to select any specific font size, family Or type from a range of fonts. So, Today, I am going to write about how we can create an simple font chooser/selection window for an text editor in python. Basically, Guys For this purpose here I am going to use tkFont module. Ans. Basically, tkFont is a Standard module comes with Tkinter Module. it's mean You Don't Need to Install it Separately But I'm not sure about your situation. This module is very compatible for this purpose because its standard choice guys. and another advantages are like, using this module we can change font configurations simply. no need to Depend on other module. So, before starting let me show you a Screenshots of Font selecting dialog box created by me. Now, Its Time To Understand How All This Works! First of all, we need to import module. So, below codes are, To import module. In Second Part, I wrote a Tkinter Class object, so that we can use tkinter functionalities as object. Why? because it's looks more easy and give us more object oriented facilities and also, it's best practise to Use. Basically, In Third Part, I am using Tkinter In Built StringVar And IntVar Variable Functionality To Make My Font Selection Window More Easy To Code. With StringVar or IntVar Object, You don't Need to keep track of created variable. In simple words, I am going to use These object like a communication pipe between functions. nothing else. actually, there are various methods are also available but i used this one, because hmm, I don't know. Now, time to add some sample. Come On! Friend it's not that hard. And, Here Come Another part of code, where all codes are Just Add Some More Functionalities, Functions, Tkinter Widget In my Font Window To Make it More Realistic.